40 roses mean my love for you is genuine. 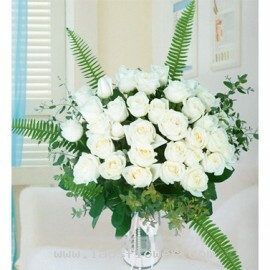 Send this bouquet now! 40 roses mean my love for you is genuine. Send this bouquet to someone you love the most. 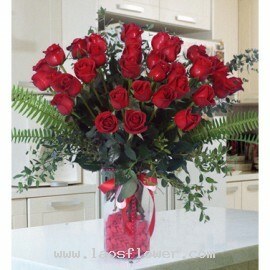 40 red roses arranged in a glass vase accents with green leaves and ferns and tied with red and white ribbon. The color of roses and ribbon can be changed. Occasionally, substitutions may be necessary to create your bouquet due to the availability of certain flowers in various parts of the countr..
A large bouquet of 40 red roses wrapped in red paper and tied with red ribbon. The colors of roses and wrapping material can be changed. Please mention your needs when ordering. Occasionally, substitutions may be necessary to create your bouquet due to the availability of certain flowers in vario..
40 white roses arrange in round shape in a clear glass vase accent with eucalyptus leaves and ferns tied with white ribbon. This vase is perfect for sending to your loved ones on birthdays, anniversaries, or send to your father or mother to show respect on special day which is coming up soon. The co..